Alana Fairchild is the singing, dancing spiritual teacher from Australia. 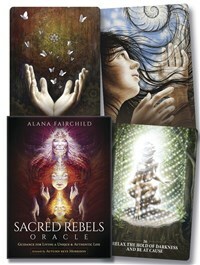 With students all around the world, Alana shares a message of love from the Divine Mother in all her many faces—compassionate and fierce, protective and wild—through unique events and her highly successful oracle decks, books and meditation CDs published through Blue Angel. Alana's great passion is the human soul—protecting it, awakening it, igniting it with divine fire, so that each individual being can fulfil their potential and live the beautiful, creative, unique life that they were born to live. Autumn Skye Morrison lives and paints in her home north of Powell River on the Sunshine Coast of British Columbia, Canada. In her studio, she overlooks a sweeping expanse of ocean, islands, mountains, and sky. She considers herself among the blessed of the blessed.